Tennent’s Northern Ireland and their agency Elevator Promotional Marketing wanted to create an engaging on-trade promotion to keep Tennent’s front of mind with both consumers and bars in a competitive on-trade environment. The initiative had to be something different and innovative, and project Tennent’s as a progressive, modern brand. The brief was to deliver a high profile sampling campaign putting pints of Tennent’s into as many hands of the target market as possible over the course of the summer. By reaching the target market at the start of their night out or drinking occasion Tennent’s would deliver their promise of “First Pint Refreshment”. Using mobile vouchers was the obvious way for the brand to drive footfall to participating bars on specific nights. Elevator tasked Púca with delivering a mobile vouchers app that would be the cornerstone of the promotion. Púca also delivered the push notifications and SMS messaging a part of the solution. Once downloaded onto a device the T’APP app displays a list of participating bars and sends push notifications with “Free Pint” mobile vouchers on selected dates. Over 170 bars across Northern Ireland have signed up to date. 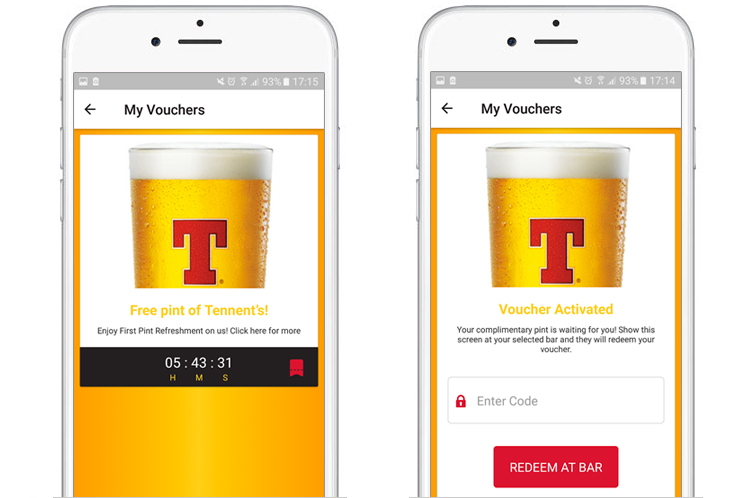 To activate a voucher the user simply clicks the link in the notification, selects the venue where they would like to enjoy their pint of Tennent’s and presents the mobile voucher in the bar before the voucher expires. There is a limit on how many vouchers can be redeemed per venue per day. Púca provided a live dashboard so the client can see how many vouchers have been issued, and where they have been redeemed. Downloads, voucher redemption rates and anecdotal customer feedback were all excellent, however Elevator wanted to understand more about what was motivating consumers to participate, and what they thought of the experience. So they asked Púca to send out an SMS with a link to an online survey to a sample of app users. View the Survey results infographic here. The results clearly demonstrate how the promotion has succeeded in creating a genuine win-win experience for consumers and the bar trade. “T’APP has exceeded all the objectives set for it in terms of downloads and voucher redemptions. And it has provided our clients with real time redemption statistics by voucher period, by consumer and by outlet, enabling them to monitor stock levels and reimburse outlets promptly. Most importantly however it has proved to be very simple for consumers and publicans to use which is crucial in a busy on trade environment”. Further Reading: check out this showcase video of the Tennent’s T’App campaign, and our solution whitepaper about Púca Smart Promotional Marketing.